When Things Break: Fix for: Can't activate Outlook 2015 on Mac "Another account from your organization is already signed in on this computer." 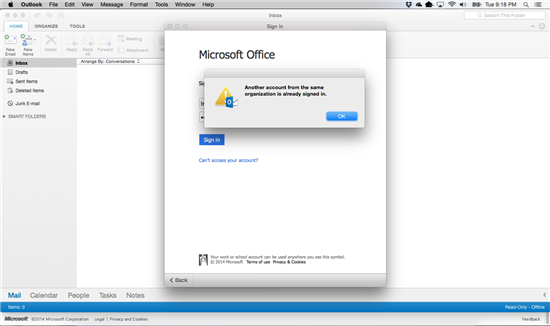 Fix for: Can't activate Outlook 2015 on Mac "Another account from your organization is already signed in on this computer." Note: OfficeOsWebHost created by activating Outlook only, maybe. 5. Boot KeyChain.app and remove following application password if need it. Note: these time stamp is same or nearly. Be careful, these keyChain object for activated account is shared with Outlook and OneNote as you know.